When the Bolshevik revolution swept through Czarist Russia, it had the aim of sweeping away the old order of aristocratic privilege. Fuelled by the intoxicating rhetoric of Marxism, the reputation of Lenin and the murderous intent of a Stalin, the Proletarian revolution actually ended up replacing one aristocracy with another. On the Nigerian Twitterverse an unhealthy trend is developing were a certain clique of persons – residing in a certain locale of the country and attributing solely to themselves ‘revolutionary and patriotic ethos’ – have assumed the airs of social media aristocrats, looking down from their ‘digital’ noses at lesser digital mortals. These aggregate believe themselves to be superior to all others, disparaging fellow citizens and organisations and dismissing alternative methods of social dissent, just because they played a ‘pivotal’ part in mobilizing the Lagos crowds during the fuel subsidy ‘occupy Nigeria’ logjam of 2012. The role of social media in forcing the hand of government is debatable. Some have argued for, many have argued against. 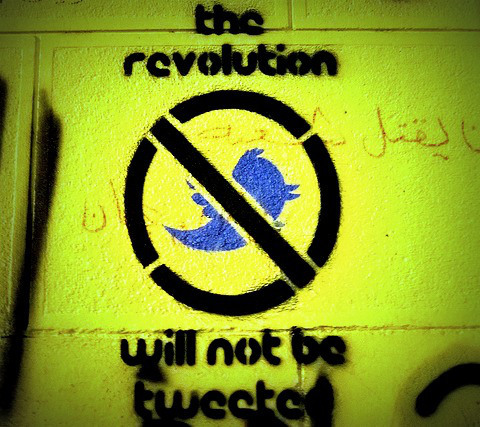 What is pertinent is that aside from the Arab world, Twitter and social media have rarely upended any governments. And before you shout ‘Eureka,’ remember that the famed ‘Arab Street’ have always been active, aggressive and revolutionary since before the computer was invented. The Iranians overthrew the Shah without one ‘byte’ of help. In media studies, the normative theories highlight how the media always take the colouration of the society it operates in. Consequently the Arab Twitterverse will easily overthrow a government, the Nigerian Twitterverse rarely. Like the Nigerian public, social media in this country will always mirror the fractious, parochial tendencies immanent in the larger society. Our Twitter aristocrats see themselves as messiahs with the true gospel and the only true way, fervently backed by a fellowship of ‘water carriers.’ They harangue and cuss, view opposing perspective as ‘haram’ and crucify any government supporter on the altar of corruption. Yet the ‘aristocracy’ is peopled with individuals with unclear histories, extreme ideologues and indiscernible motivations. In Mass Media studies, ‘silver bullet’ theories died over 40 years ago. The media are not omnipotent but instead media effects are determined by a pot-pourri of social class, education, motivations, culture, affiliations and the plain old individual differences of the recipient. As is often said today, the media is overrated: true for television, true for Twitter and social media. That you have 5000 Twitter followers may elevate you to an agenda-setter but definitely cannot make you super-influential (nor refer to people as scum). As a change agent, the media is useful in introducing and keeping issues on the front burner, but the conversation must be engaging and encompassing for change to happen. Nobody or section of the media owns the right to the monopoly of ideas and solutions. The advent of social media democratized media access and participation. The traditional media lost sole grip and citizen journalism came to the fore. It is unfortunate that certain citizen journalists of the new media who have been in the forefront of the social media revolution in Nigeria are ascribing to themselves aristocratic status. Have some animals become more equal than others? Do You Know What Makes Your Company Distinctive?